With brass tones highlighting the clear accents of the base and a double shade design, this crystal brass table lamp is a great piece for contemporary decor. Give your home a touch of modern class with this crystal brass table lamp. Clear columns rise up to support a smooth crystal ball to form the base. The circular double shades provide a soft touch in lovely neutral tones. 27" high. Base is 5 3/4". Inner shade is 14" across the top and bottom x 8" high. Outer shade is 16" across the top and bottom x 10" high. Takes one 150 watt medium base bulb. On-off switch on the socket. 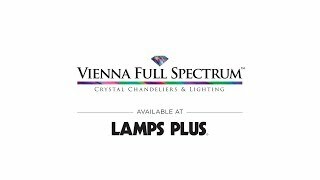 A Vienna Full Spectrum™ modern crystal and brass table lamp design. Brass finish; glass and metal construction. Poly cotton fabric shade. Organza outer shade. 8-foot long clear cord and plug. Weighs 11 pounds. Ordered to match lamp ordered a month ago. The simple and contemporary style with Crystal and brass combination is exactly what I look for. Love the design and style, combination of glass and brass! Is base a soft gold? Is shade White? BEST ANSWER: Yes to both questions. The shade is white, but there are two levels. The inner shade is solid white, and the outer shade is white mesh. The gold is soft, not bright or too yellow. The lamp is solid and quite heavy. I would call it true gold... not champagne gold. The shade is white and takes on a silvery look in certain light. Thank You, I am considering purchase two!! Hoping to see some reviews!! Is the shade true white? BEST ANSWER: Yes - this includes a white inner shade. Weight? Composition of inner shade? BEST ANSWER: Hi, the table lamps weighs 11 lbs and the inner shade is constructed of poly cotton fabric and the outer shade is organza. BEST ANSWER: Hi - the lamp is 26 3/4" high. A luxurious crystal column table lamp in a slendertapered shape topped with a chic double sheer silver and white drum shade. Complete with an off-white Belgium linen shade and a polished nickel finishHudson Valley&#39;s Archer table lamp makes a gorgeousmodern accent for any table.